We managed a content team for Avvo.com. 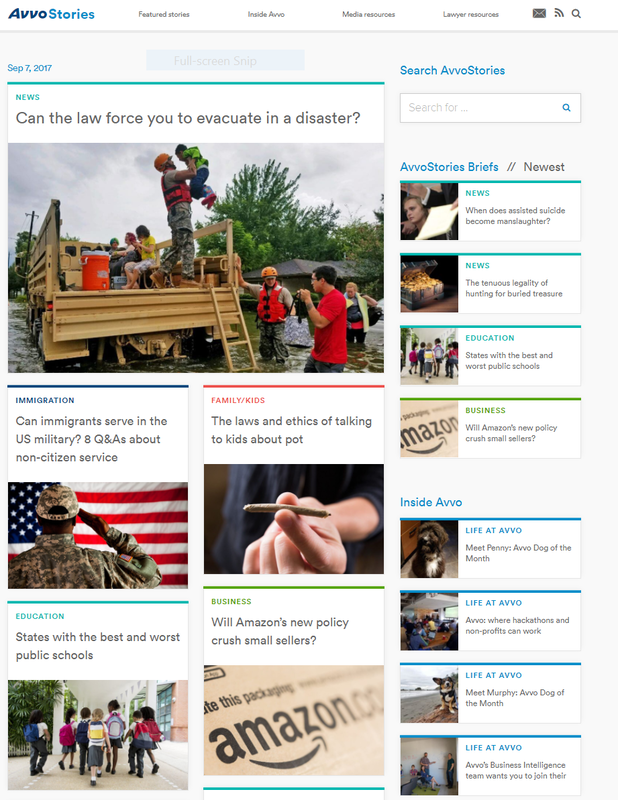 The team, made up of freelance writers and an in-house managing editor, provided Avvo.com with pitches and feature articles on a wide variety of general interest legal topics as well as specific topics related to its legal services and audience research. Our client at Avvo.com client was a former client from MSN. When he moved to Avvo.com, he reached out to see if Denny Mountain could find and manage a team of writers, provide editorial oversight, and produce content on a regular cadence for the company’s Stories blog and Lawyernomics site. He needed to outsource some content management to gain the time he needed to concentrate on strategy and marketing. Avvo.com is in a competitive and ever evolving business. Denny Mountain offered a reliable and effective partner that matched Avvo.com’s rhythm of business and could quickly change gears as its marketing goals evolve. Our writers and editors are seasoned professionals who were able to zero in on the details and produce good copy while also understanding the big picture of what Avvo.com is trying to achieve: disruption of the legal business status quo. Our content team produced hundreds of articles on a wide variety of topics, from beating a DUI to game-changing laws for renters.